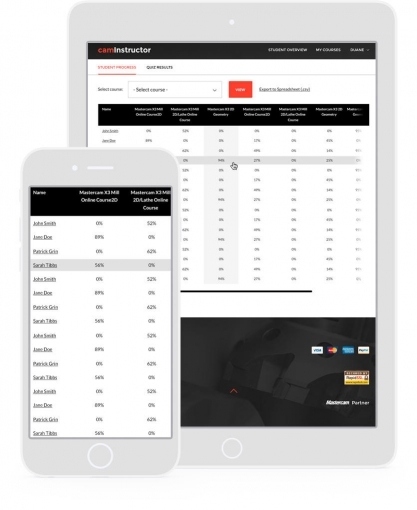 Supervisors at your company can login and view the progress of each employee including quiz scores. I like the fact that I can check the progress of my employees enrolled in this course. 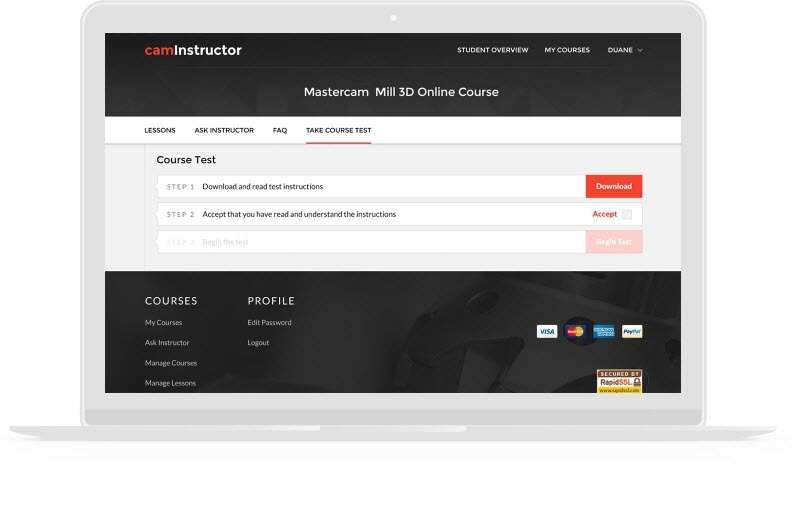 camInstructor online training features examinations for each of the Mastercam modules. Employees are required to create real parts in Mastercam and are graded by a certified instructor. Certification helps lets me know I'm getting my money's worth. The “Ask Instructor” feature allows employees to have their questions answered by a Mastercam instructor at any time throughout the course. We are very impressed with the Instructor's knowledge. Easy to follow lessons based on creating real parts. Convenient and money saving, no need to send employees out of the office. Students learn at their own pace through a combination of videos, printable lessons, and regular quizzes and exams. Track exactly which modules and lessons have been completed by your team members. 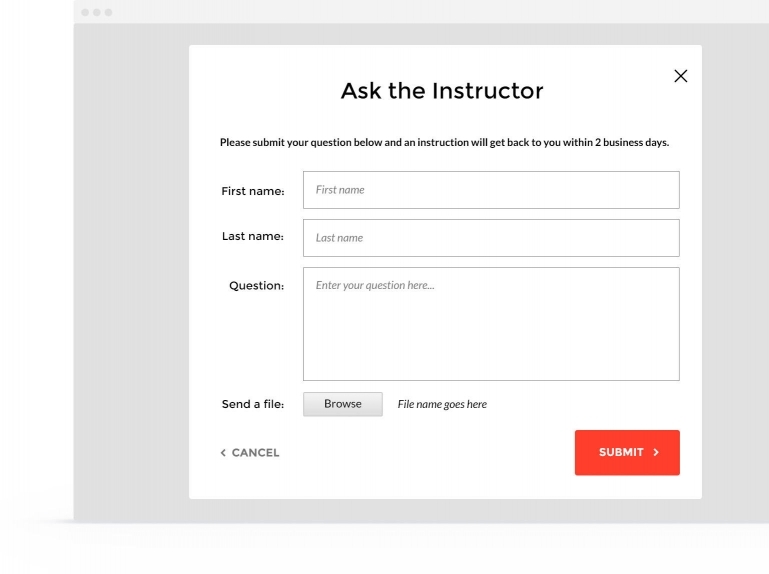 Unlimited 365 day access to a Mastercam instructor via Ask Instructor feature. $950 for access to all 16 courses. *approximate cost, actual costs may vary. 200+ Hours of Mastercam Training: 7 Courses covering Mill 2D, Mill 3D, Lathe, 4 Axis, 5 Axis, Solids and Wire. Mastercam Home Learning Edition Software. Access to a Real Instructor. Ask our instructor unlimited questions for a year. 4 Certification Exams. Earn a certificate in each of the Mill 2D, Mill 3D, Lathe and 4 Axis courses upon successful completion of course test. Includes Mastercam 2019 & 2020 (once available). Track and review employee progress. Please contact sheila.weidinger@caminstructor.com or phone 1-877-873-6867 x705 to receive volume pricing. Mastercam Mill 2D, 3D, Lathe, Solids, Wire, 4 Axis & 5 Axis Courses. CNC Programming Mill & Lathe Courses. SOLIDWORKS Sketching, Modeling, Assemblies & Drawing Courses. NOTE: SOLIDWORKS Software is NOT provided with this product. Certification Exams. Earn a certificate is available for certain courses upon successful completion of course exam. I am very impressed with the quality of your the Mastercam Training Products by camInstructor. Thank you so much for your quality training products. It makes it a lot easier with the videos. The lessons have been very helpful, filled in a lot of the blanks. Well worth it. I found the camInstructor online training, very detailed, user friendly and access to great instructors.